Aakash Chopra has represented India in ten Test Matches. He is known for his solid batting at the top of the order. A very good technically correct batsman Aakash Chopra is the part of the Ranji Trophy winning Team Rajasthan in 2010-11 and 2011-12 season. Here is the complete profile of this cricketer. Aakash Chopra is an Indian Test cricketer who played as a solid opening batsman. He along with Virendra Sehwag provided India some very good partenerships in Tests during his ten Test career. He is known for his defensive approach of batting. Currently he is the part of Rajasthan Team in domestic cricket who won two consecutive Ranji seasons. His contribution in these two seasons for Rajasthan was very important in the success. Aakash Chopra started his career in limited over cricket in domestic season 1996/97 for Delhi. His first-class debut came in the next season. He scored two centuries in his debut season. He performed consistently in domestic cricket for Delhi and North Zone Team. This results in his inclusion in the Indian National Team in 2002-03. 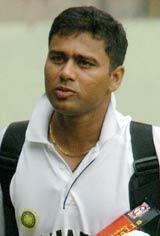 Aakash Chopra played his first Test at Ahmedabad in 2003 against New Zealand. He made 42 off 116 balls in the first innings and 31 off 72 balls in the second innings. He showed solidity in his batting. In his next series in Australia. He doesn't scored too many runs in four test series but his good opening starts with Sehwag which includes two century partenerships. In his next series against Pakistan he made another century partenership with Sehwag in the first Test at Multan. After that match Chopra failed to perform good in the second test. This results in getting out of the playing eleven in the next match. He made comeback in 2004 but not performed well in two test matches against Australia. After losing his place from the Indian Test Team, he played regularly in domestic cricket. In 2007/08 season he made 783 runs for Delhi. Delhi won that Ranji Trophy season. In 2010-11 Chopra started playing for Rajasthan. Rajasthan won two consecutive Ranji titles in which his contribution was very much important. Aakash Chopra also played in IPL (Indian Premiere League). He played for Kolkata Knight Riders in the first season of the tournament.